There is quite many experimental data from the happy owners of power meters. Such data could be used for finding cycling perfomance parameters as roller resistance and air drag. 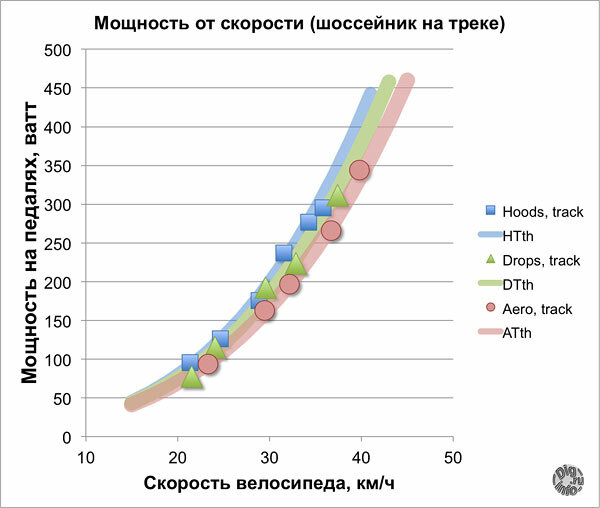 As an example, let’s consider the excellent work “Bicycle aerodynamics for entertainment” (in russian). The author has two bicycles, road bike with aerobars and TT-bike (bicycle for racing with separate start, which usually ride on a flat place at high speeds without a ride in a group), equipped with pedals with integrated power meter. The author has made a series of rides at track and at velodrome in different sitting position from aero to more upright. The main purpose of the work (I think) was to determine for himself how much gives TT-bike compared with road bike. It turned out that the advantage is quite significant, for the same consumed power TT-bike gives significantly greater cruising speed. From this work I will take only the data for road bike. So-in takes place in three different aerodynamic positions, “hands on pistols” (hoods – in the article), “lower grip” (drops) and “on the sunbed” (aerial). That is, if we look at the picture, it is three left places from the second figures. In the rides it was measuring speed, which was achieved when a cyclist pedaling with different power. Rides took place on the cycling track (indoor, frequent turns) and at velodrome (in the air, with large straight sections). As discussed in the article “How spent cycling power during moving a bike“, there are two “muddy” cycling perfomance parameters: coeff. of rolling resistance and coeff. of aerodynamic drag. 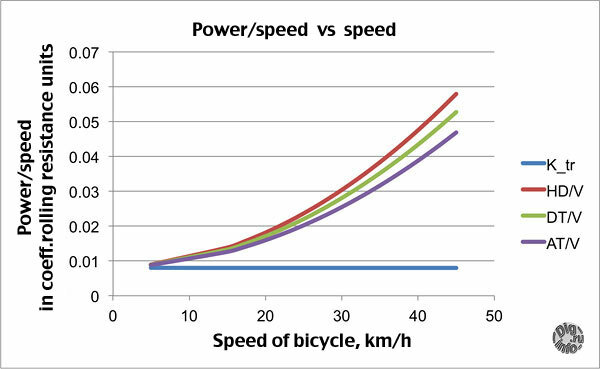 The other parameters that take power from cyclist can be “kept under control” (this is weight, slope of the hill, efficiency of transmission). 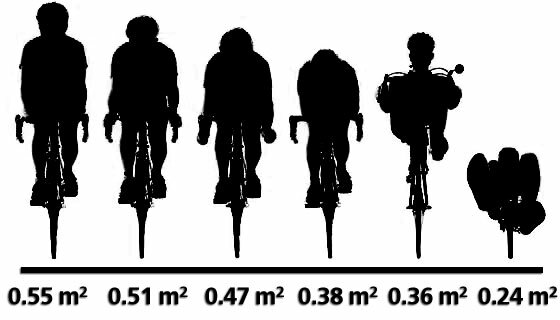 The drag coefficient is also interesting among cycling perfomance parameters, although it will be parameter of author, whom I have not seen, so compared with can not. Nevertheless, the network has some of the arguments that I can not take by “believe”. For example it is believed that coeff. Cx flow (remember that coeff. if aero-resistance is the multiply of area of ​​a frontal section and coeff. of smooth flow of air) depends on the pose of cyclist. In my opinion twisting feet and details of the bike give so much turbulence that about different quality of air flow in different poses we can speak very tentatively. Go to the experiment. We believe that there were no hills. So you can only vary two parameters: coeff. of rolling resistance and coeff. of aerodynamic drag. Since the power was measured on the pedals, the power efficiency of 0.96 will achieve the wheel. Weight of the author (together with the bike) is not known, will take it to 80 kg. 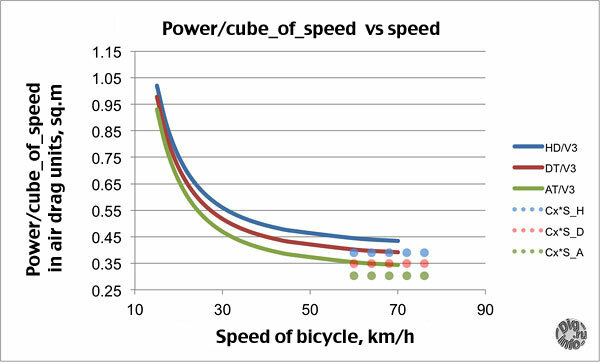 Further, by varying the two cycling perfomance parameters we need to maximize the coincidence of experimental and calculated data for all 6-series of measurements (three on the cycle track, and three at the velodrome). It graphically shows the results for the three series on the cycle track. Coefficient of rolling resistance of road tires “Continental Gatorskin”, on wooden cover of track or on smooth asphalt of velodrome is the same = 0.008. It is twice more than what the network is considered to be the norm for the road tires on asphalt. It can be seen that the values ​​about the same, that is the quality of the air flow does not depend on what position cyclist take place. But the value itself of the author is very good, the network is often considered for road bike Cx = 0.88.